Pepperoni not your favorite pizza topping? It can easily be switched out for anything that tickles your fancy. I think next time, we’ll be shooting for a Supreme Pizza Soup, and adding in olives, peppers, and onions. I’m also hosting a virtual soup swap today with some of my blogger friends. If you’re looking for soups to keep you warm this winter, we have you covered! Add the browned and rinsed Italian sausage to the slow cooker. Stir in spices, tomatoes, water, and bouillon until well combined. In a separate bowl, whisk together the tomato sauce and flour. Stir into the slow cooker. Cook on low for 6-8 hours or on high for 4-5 hours. Before serving, stir in the pepperoni and cheese, until melted. Pizza is awesome in any form! My husband would love this. Yes! My pizza-loving kids were super happy with this! This might be just the thing to turn my guys into soup lovers! Pinned! This looks delicious and I bet it would be a hit with my kids! I also love that it is made in the slow cooker. Kid-friendly AND ready after a long day of errands! You can’t beat it! I absolutely love this soup! Love all the cheese and the Italian sausage. It’s a winner for sure! Pizza in a bowl, very clever! Thanks for hosting, Kate! Pizza in any form is always a good idea! Years ago I used to make pepperoni spaghetti. I need to try this soup!! Pepperoni spaghetti sounds like a winner too! My kids will eat anything I can spin as “pizza”! This sounds so delicious and filling! I love the suggestion of making different kinds for different pizzas.. I would love some mushrooms and olives on here!! Yummy! This looks so delicious and fun to make. And I agree, I bet kids would love this soup! It’s hard for any kid to argue with pizza! Thanks for hosting Kate. I think my family will love this soup. Thanks for celebrating with us! I hope they do love it! This is one I’ll be putting into rotation very very soon! I’ve never thought to put pepperoni in a soup before! This is brilliant! Oh, how yummy! 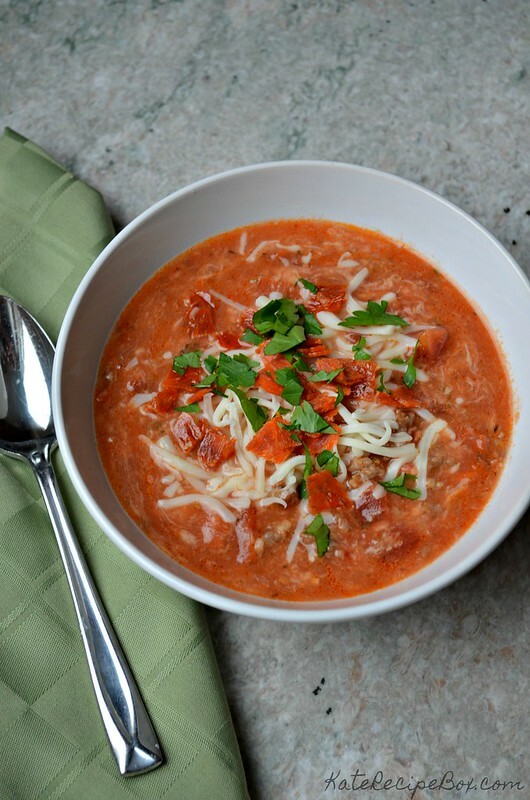 Pizza soup sounds amazing and perfect for a winter day! Add some garlic breadsticks and it’s the best winter meal you could ask for! I love everything about this soup. 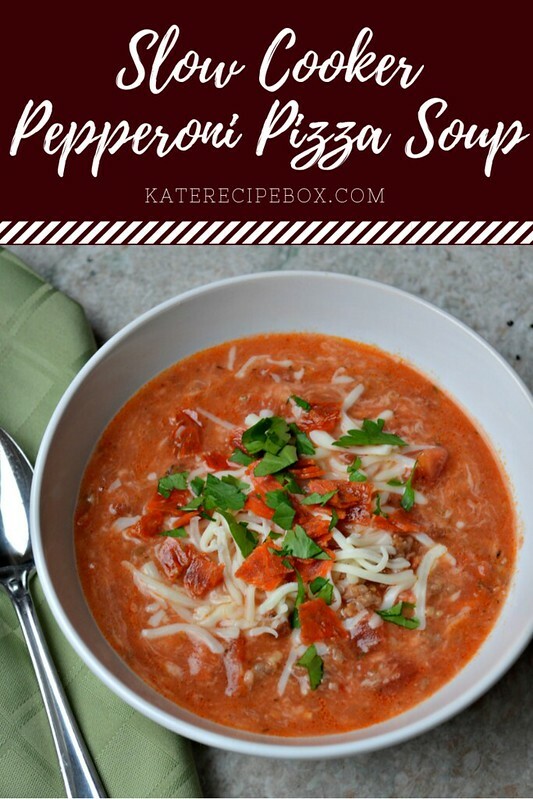 The pizza flavors are fantastic and making the soup in the slow cooker is my preferred way for soups! My favorite meal in soup form, and one of my 2019 cooking resolutions is to use my slow cooker more! 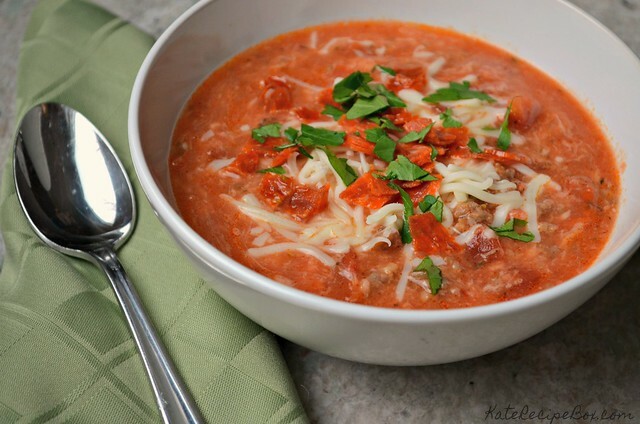 I love pizza so much, and I am sure that I will absolutely adore this soup!